✓	Split & merging of lot no. Tiara.NET isunique idea tooverview business information remotely without any dependency. 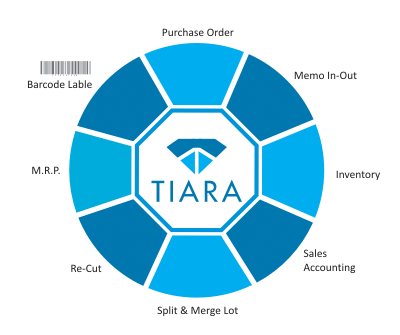 Tiara.NET cloud technology helps Management real time reporting for quick decision. What are the features of Tiara.NET Cloud Reporting? 2. Outstanding Accounts Receivable / Payable. How much it is Secure? Tiara.NET technology is unique idea allow user LOGIN directly to their own Server inside Tiara Console to view information. All information view on Server Only. Tiara.NET design structure is one way only to view reporting and with permission to PRINT/ EXPORT the information. Once User LOGOUT, Tiara.NET only having Company User Credentials without any company DATA. All Rights Reserved by Tiara Softwares LLP.